Last Sunday, I found myself sitting court level at the SHAC covering the men’s basketball team. I, like most of the media guys around, was a bit weary at this point. The weekend saw six events over four days (thankfully, my volleyball guy lightened the load for me) and this was the last game of the weekend. So, there we were, half-watching what we correctly assumed would be a Bison blowout of tiny University of Minnesota- Morris. There was not much that stood out about that game, other than the fact the Bison had five guys in double digit scoring. 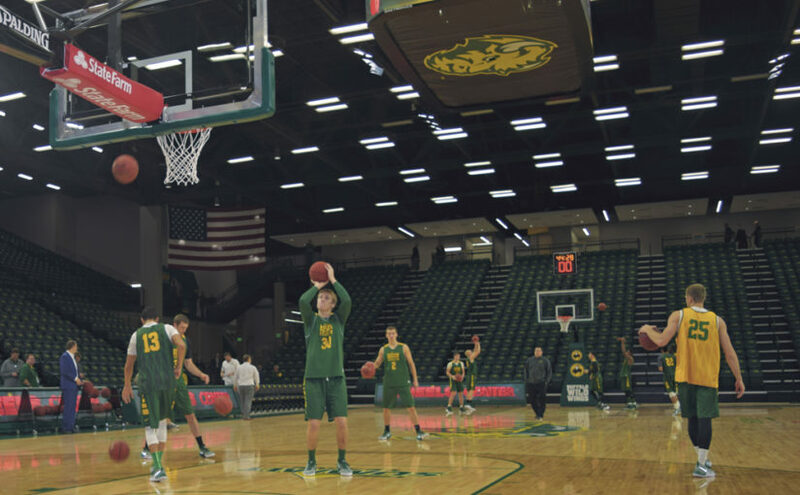 The Bison would end up winning 92-62, but the real takeaway from the game came early in the first half. After just seven minutes, the Bison were already controlling the game, but the Cougars were hanging tough and had just hit their third three-pointer of the evening. Head coach David Richman could be described best as hot. The Bison inbounded the ball, went down and Richman told Paul Miller to call a timeout. Miller obliged. “There is a standard and expectation in this program. If we don’t see that, we need to get back, teach to that standard,” Richman continued. Following up on the game, trying to figure out how to write about it, those words stayed with me. Thinking back on my time playing sports in middle and high school, one word came to my head, complacency. Any athlete can tell stories about struggling with complacency. I remember playing peewee hockey; beating a team 10-0 Friday night, and losing 1-0 the next morning to the same team. Being complacent is the kryptonite in any sport, and something that can’t be helped some times. You see it almost every day. Sometimes, the complacent teams still get the win, like TCU pulling away from SDSU in football back in September. Sometimes the underdogs pull it off. A good example is to look at the Big 10 non-conference football season this year. Northwestern losing to Illinois State, a team that has been beaten often in the FCS is one. I feel like there is another example, as if a ranked Big 10 squad invited an FCS team into a pink locker room only to lose in the fourth quarter. I just can’t put my finger on it. Playing a D-III opponent will likely give you that sense of complacency. I applaud coach Richman for sensing that in his team on Sunday. I also can’t blame the team for feeling that. Coming off the highs of opening a building with a win just two nights before, and facing a “cupcake” opponent. It doesn’t have the same sense of excitement and can just lead players into a lull. I fully expect Paul Miller, AJ Jacobson & Co. won’t let it happen again. There aren’t any worries going forward. On Tuesday, Richman thanked the older players for stepping up to lead. No real worries there. And that is something about this “Bison culture” at NDSU. No matter how successful teams are, there is always a drive to get better. Even when I am long gone from this campus, it is something I will always respect about NDSU. You can count our success by how many trophies fill the cabinet. In reality though, the real success is through the effort BisoNation shows on the court. That is the real strength of the Herd.